You'll be £25.00 closer to your next £10.00 credit when you purchase SAS - Men in the Making. What's this? Peter Davis was the youngest officer in the SAS during World War II. In his autobiographical account, he reveals the naïve enthusiasm he felt when he joined the Unit, his fears and trepidation during training, and the horror at what he later experienced during his first operations in the liberation of Sicily and Italy. This is his story. It explores the difficulty of a young, inexperienced officer leading older and seasoned soldiers. It tells of mistakes a 'rookie' can make and of how listening, learning and ultimately earning respect made him the skilful leader he ultimately became. During later operations he was awarded the Military Cross. Through it all the enigmatic figure of Paddy Mayne looms large. At times irrational, aggressive, and often drunk, he was always a born leader able to instil obedience and respect. Where he led, men followed. This autobiographical account was written shortly after the end of the War, using diaries written at the time. It is possibly the last, untold, first-hand account of a time of chaos, of horror and of the camaraderie of the men of the SAS. Possibly one of the best veterans accounts concerning service in the Special Raiding Squadron that exists and has been turned into an excellent book by his son. This book is highly recommended to anyone who has even a passing interest in the history of the Regiment during the period from 1942 to the end of WW2. This is a fascinating first-hand historical account. Peter Davis was the youngest officer to serve in the original SAS Regiment (“SAS Mark1”, which was disbanded in 1945) during the Second World War. During his SAS service, he kept a diary – in defiance of instructions – and soon after the war, demobbed and waiting to begin his studies at Cambridge, he wrote it up into a book that was never published during his lifetime. Original SAS memoirs are few and far between. Roy Farran’s, Mike Calvert’s and David Stirling’s writings immediately come to mind, but not many others. It is likely that Peter Davis’s SAS will prove to be the very last first-hand account of the wartime SAS, its camaraderie and hair-raising operations, ever to be published. 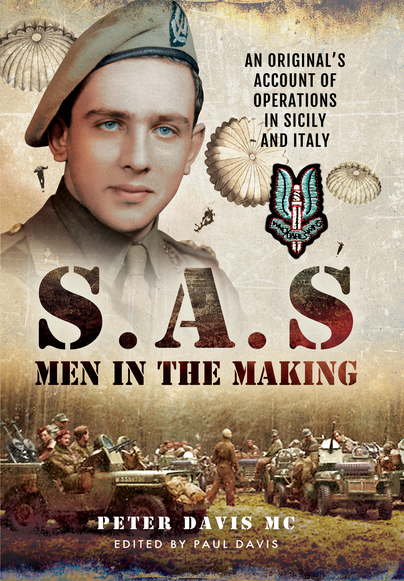 It follows that this book is a godsend to the researcher with an interest in SAS Mark 1 and in the Italian Campaign in which Davis served and won the Military Cross. As a bonus, the numerous illustrations are contemporary photos taken by Davis in the course of his campaigns, so we know exactly what he and his comrades looked like, what they wore and where they lived. It is not only researchers who will wish to read this book, however. Peter Davis, while not a literary giant, has an easy and readable style. One would have liked to have known him: he comes across as modest, commonsensical and honest. He does not go in for macho posturing; in fact, he admits the fairly numerous occasions when, as a rookie on a steep learning curve, he made silly mistakes. It is equally clear that Davis later became a skilful and resourceful leader, who earned his men’s trust. “SRS, prepare to embark”. This was the chilling phrase broadcast over HMS Ulster Monarch’s tannoy as the ship anchored in the waters off Cape Murro di Porco south of Syracuse on 10 July 1943. It alerted the SAS men of the Special Raiding Squadron (SRS) that they would soon be in action. Their target was a heavily defended Italian gun battery sited on top of the cliffs of the cape. The men had been told that the fate of the whole invasion of Sicily depended on them. In the eerie glow of combat lighting, they now waited in final suspense. Each man knew it was possible that he might not survive the night. On the order “SRS, stand by to embark”, the men headed towards the oiling doors where they would climb into their landing craft. Here they waited again, but already activity was subduing anxiety. At last the call came: “SRS embark”. Apprehension vanished. Peter Davis was there that night. As the last veterans of WW2 die, the opportunity to hear vivid stories directly from them dies with them. There is a profound sense that there will soon be, if not already, no more new tellings. So the publication of Peter Davis’ account of the invasion of Sicily is as surprising as it is rare. Until now, the only full, fresh account of Sicily by an SAS veteran was Derrick Harrison’s excellent “These Men are Dangerous”. Harrison was a section commander alongside Davis. Both accounts, recorded shortly after the war by articulate, intelligent writers, are doubly precious because they are full of the details usually lacking in accounts made many years later. There are details of place, details of atmosphere and, perhaps most valuable of all, details of emotions. The combination brings history to life. ... There are also many photographs, many of them apparently never published before. Davis’ tone is pitched well throughout. Although he tells the funny stories that soldiers are so fond of, they do not dominate or distort the history. One of Davis’ great strengths is that he never shies away from admitting to the effects of fear and apprehension, whether learning to parachute, waiting to fight, or staring into the enemy-filled night. There are no false heroics here. He struggles, understandably but successfully, to describe the remarkable nature of the men of the SAS, whom he clearly loved: the roguishness mixed with villainy, the disciplined indiscipline, the heroes conjured out of those whom society might well look down on. His account is a tribute to these men, and an attempt to hold on fiercely to times he would never see again, and would always miss. This book is a wonderful find. Many thanks to Paul Davis for bringing his father’s account out into the world. The dictum of many of the men that served with Peter Davis was: better to die happily having 'lived' a little than never to have 'lived' at all. All shared the intense lives of complete military professionals with the pride of being a part of the SAS. These were ordinary men as the fears and concerns of Davis show but they were also extraordinary because they control intense fear and carry on with the tasks they have been set. This book is a great tribute to those men. It is an honest and very readable account of the life of a young officer whose readers can do no more than respect and rejoice he survived. To be murdered in his home in South Africa in 1994 was not what he deserved. Peter Davis was born in August 1921. He joined an infantry unit after school, deferring a scholarship to Cambridge until after the War. In 1942 he joined the SAS. This book tells of his experiences in Sicily and Italy in 1942 and 1943. He went on to be promoted to Captain and following a skirmish in France in 1945, was awarded the Military Cross. After the War, he took up his scholarship and was granted a Master of Arts degree. He married and moved to South Africa. Peter was murdered on 4 March 1994 and this remains an unsolved crime.